Description of "ALL ABOUT ECONOMICS (eBook)"
The book will act as a single source reference for all those who wish to supplement their basic proficiency in economic terms used in day-to-day life pertaining to economy, finance, banking, investment, accounting and trade. The book contains 1400 entries covering common and not so common economic terms, from asset and liability to Lorenz curve and zero-sum game. It is an all-encompassing volume that includes the significant development in economics, as well as contributions made by such noted economists as Adam Smith, John Maynard Keynes, and John Kenneth Galbraith. It consists of an easy-to-use, extensively cross-referenced text that will be of invaluable assistance to anyone seeking a better understanding of economic terminology. It has specifically covered economic terms used in international economics during recent global economic recession such as Sub-Prime Lending, Double Dip Recession, Eurobonds, European Financial Stability Facility, Junk Bonds, Exotic Derivatives etc. It is a book primarily aimed at aspirants of UPSC, State civil services and banking examinations however, it can also be used by students, home-makers, teachers to enhance their knowledge and understanding of economics. The book may be used to brush up the fundamentals just before a competitive interview. It keeps abreast with latest developments in Indian as well as international economy. The book attempts to simplify many of the economic jargons and offers a quick, reliable and up-do-date coverage of economic terminology. It is written in a simple, lucid and comprehensive language which will help readers to easily grasp the nuances of economic terms. It contains homely terms as well as terms which are quite commonly used but whose meaning is not very clear. It also aims at spreading financial literacy among the educated strata of our population. The author of the book is a young IAS of Maharashtra cadre. She has 5 years of working experience in Reserve Bank of India as a Manager. The author has successfully qualified in bank PO/ RBI Gr. ‘B’/UPSC/UGC Net examinations in her first attempts. Academically, she has three Master degrees to her credit, the first in English Literature in 2005 (Gold Medalist, University of Rajasthan, Jaipur), second in Public Administration in 2007 (University of Rajasthan, Jaipur) and third in Rural Development in 2009 from IGNOU. The author is a UGC NET qualified in Public Administration. She has also cleared JAIIB and CAIIB from Indian Institute of Banking & Finance. 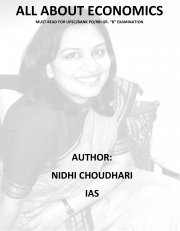 At present, the author is pursuing Ph.D. in Public Administration from IGNOU, New Delhi. She has been in the field of writing since last 15 years and many of her articles and papers have been published in leading newspapers and journals the prominent being Banking Chintan Anuchintan, CAB Calling, The Indian Banker, Bank Quest etc. She has presented papers in Seminars on economic issues and has won All India Level Essay Competitions by National Housing Bank, SIDBI, IIBF etc. As a successful candidate of UPSC, RBI examination and Bank PO Examination the author has a treasury of experience and awareness about the requirements of competitive examination and this wealth of knowledge has been summed up in the book titled "All About Economics". Reviews of "ALL ABOUT ECONOMICS (eBook)"